The Lake Parsippany Track and Field Team Hosts the yearly Hub Lakes Championship Meet. This is a Half day event open to all members and age groups. Once again the Lake Parsippany Track and Field team will be entering and hosting the Hub Lakes Half day Track and Field meet. As host, it would be great to have a large turnout for our own team. The meet will be the 3rd Saturday of June (Father's Day Weekend) at Wildwood Elementary in Mountain Lakes. This meet is for all ages and all athletic abilities and is all FOR FUN. 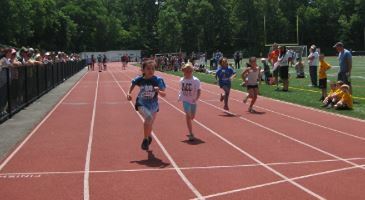 The Track events range from a 25 meter sprint for the younger athletes, all the way up to a mile for the older athletes. In the Field events, we have the standing long jump, long jump, softball throw for the younger athletes and shotput for the older athletes. Even if you’ve never participated in Track or Field, it will be a fun day for you and families in the lake area.